Does Britain have too many graduates? More 18-year-olds than ever before were accepted into higher education in 2015. Overall, a record 463,700 people from the UK – 235,400 of them aged 18 – entered higher education in 2015, according to UCAS, marking a 2.8% increase on 2014. In England, 42% of today’s young people have entered higher education by age 19. But is there an over-supply of graduates in the UK? In a new report on supply and demand for higher-level skills, Universities UK (UUK) concluded that there is little evidence of “graduate oversupply”. Instead, its authors argued that the economy requires “an even greater number of higher qualified workers”, and that they may actually be underestimating future demand for graduate talent. These conclusions are likely to come as a surprise to the substantial numbers of recent graduates who have found it hard to find a job that requires them to use the knowledge and skills they acquired on their undergraduate courses. Unprecedented numbers of recent graduates have experienced unemployment or underemployment since graduating in recent years. Our own research, including the Futuretrack project, has followed the early career experiences of a large, nationally-representative, sample of graduates who completed UK undergraduate degree courses in 2009 or 2010, graduating into the post-financial crisis recession. Drawing from our data, we concluded that in winter 2011-12, 32% were in jobs that did not require “higher-level skills” – defined by a bachelor’s degree level qualification. A further 12% were unemployed and 20% had experienced at least one period of unemployment since graduating. Which graduates are using their degrees? Our data can help to better understand where there are shortfalls or oversupplies of graduate knowledge and higher-level skills, and which categories of graduates have been unable to access employment. The graph below shows whether graduates used their subject knowledge, and skills they had developed as undergraduates, in each job they had held since graduating. 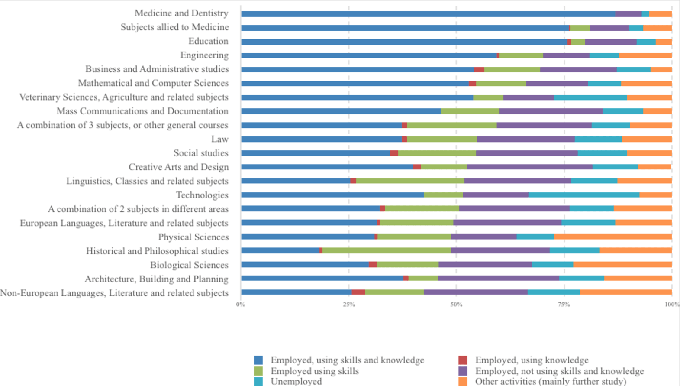 It is not surprising that those who completed very vocational courses mainly show up as blue and green on the graph above, meaning they are using their knowledge and skills in their current job. Nor is it surprising that only a quarter of those who studied linguistics and classics were using their subject knowledge, given that demand for specialists in these subjects is small and the high-level communication and problem-solving skills that they develop have traditionally been recognised as predominantly transferable. But overall the graph reveals substantial under-utilisation of skills that, along with the reported unemployment, reflect a shortfall in demand for such skills. This could be caused by a number of reasons, for example because students have chosen their courses unwisely and developed “the wrong kinds” of knowledge and higher-level skills. Or, as in the case of architecture, building and planning graduates, it might reflect lack of government and community investment in housing and infrastructure, or in the case of languages, insularity and lack of appreciation of the value and potential of the knowledge and skills on offer. Experts: those in knowledge-intensive occupations that require them to draw on and use their specialist university knowledge and skills in their daily work. Examples include civil engineers, pharmacists, solicitors, physiotherapists and chartered surveyors. Orchestrators: those in jobs that require them to draw on and orchestrate their knowledge and the knowledge of others to evaluate information, assess options, plan, make decisions and co-ordinate others. These jobs are dominated by managers and directors but include senior officers in the armed services and the police force. Communicators: those who require interactive skills that may be based on interpersonal and communication skills, creative skills or high-level technological knowledge. Examples include journalists, actors, conference and exhibition organisers, web-designers and marketers. A fourth category of non-graduate occupations – where degree-level education is clearly not neccessary in order to be able to do the job well. Type of occupation or other activity 18-30 months after graduation, by subject studied. 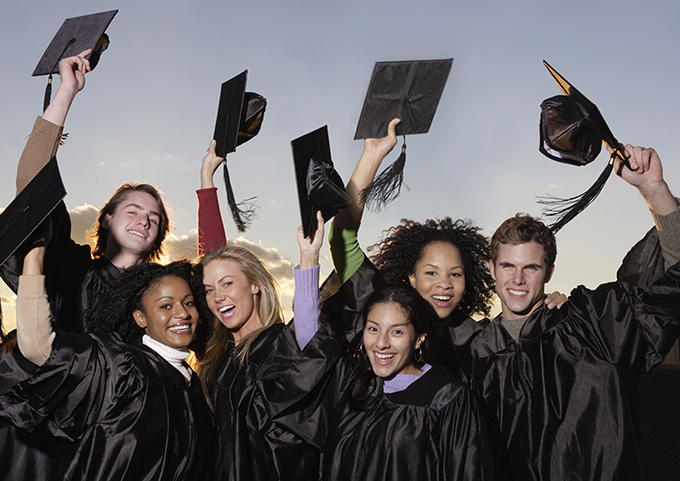 Futuretrack Survey Stage 4, UK-domiciled graduates in employment only. As the graph above shows, the distribution of these jobs gives cause for concern. Three quarters or more of those who had chosen to study the most directly vocational subjects, and those who had specialised in numeracy-based disciplines, appeared to have got a job appropriate for someone with their qualifications, knowledge and higher-level skills. But the categories of graduates at the other end of the spectrum were very significantly less likely to have done so. In some cases, this may reflect a short-term impact in the wake of the recession, and the well-established fact that some categories of graduate, notably those who have studied arts and humanities subjects, have traditionally taken longer to be integrate successfully into the graduate labour market. Findings from our ongoing research indicate that despite an increase in the proportion of graduates in non-graduate jobs from the beginning of the 1990s, the majority of graduates managed to get appropriate level jobs until the mid-2000s. Since then, during and following the recession, the proportion of graduates unequivocally under-employed has increased steeply. On the basis of our work on the match between available jobs and graduates, you might conclude that we have an over-supply of graduates in Britain – however, this takes little account of the intrinsic value of higher education. Although there has been a slight recovery since 2012, and despite the fact that major graduate recruiters report growth in graduate recruitment and an inability to fill vacancies, we question whether this reflects a “mismatch” of graduates. Instead, it may well reflect mismatches in the provision or quality of higher education courses in relation to the changing needs of industry, commerce and the professions. At the same time, there is growing competition from highly-skilled job applicants from other countries in the increasingly global and fluid labour market. It is time to consider the implications of an important aspect of the current labour market too rarely raised in policy debates – the inappropriate expectations and lack of investment in employee training and development on the part of employers.